Here I bring you one of my favorite Concealer this new year! 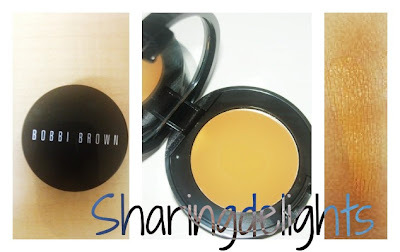 Its Bobbi Brown's Concealer (Golden)A moist formula that provides a creamier consistency and easy to blend, also Bobbi Brown's creamy concealer won't highlight fine lines and wrinkles, while still providing enough cover for dark circles. I dread my dark circles, BB concealer works for me and is very effective. Talk about double the pleasure of hiding your wrinkles and dark circles? I always take my Bobbi Brown Concealer with me everywhere!